Can it really be almost a month since I last wrote? Summer is drawing to a close..school starts for Matthew on Sept. 7th and he will be going into the 3rd grade. He has been in summer lessons for the past month and hopefully we will see an improvement in his reading. Felix and I are keeping busy in the clinic and with Rotary. I was chosen as the secretary for this year July 09 – June 10 which means more meetings and responsibility. The challenge comes in trying to keep the minutes since they are to be recorded in French. So far I am keeping them in English and will try to find someone to translate them for me. I might type them up and use a computer translation tool and then have someone correct that. My cousin in Florida, who teaches French has just offered to help me with the translations. Thanks, Leslie!! Last Saturday we had to leave home at 6:30am to attend a Catholic double funeral for an elderly couple who died five days apart. It was interesting. They were founding members of the Rotary Club in their town, Les Cayes. He was also a Mason so we got to witness their ceremony at the gravesite. Matthew was with us and it was his first time seeing dead people. He seemed to handle it fairly well. Then, just as we stepped into the clinic at 8:00pm a hydrocephalis baby that has been abandoned at the clinic died. Miraculously enough, one week before he died, we were able to find his mother and she came with plans to care for him in the clinic. After weeks of caring for him, we finally knew his name, Wakins. Felix turned arounded, headed back out into the night to take the body to the family. They received it graciously and Felix urged them to honor the little one in death. It was close to midnight when he got back. We had hoped to be able to get the surgery done by a visiting surgeon who is coming to Haiti in September. 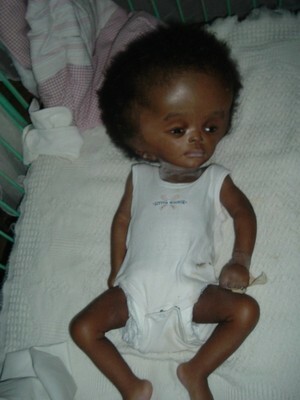 When Wakins was dropped off in June his head measured 60 cm. In the last days it was measuring 75 cm. A lady who has had great success in linking special needs children with those who can help didn’t hold out much hope for this little one since his case was so advanced. Matthew was grief struck at the loss of “his little brother” and we had an opportunity to talk about heaven and how God cares for his children. It does make one wonder what purpose all this has, the coming of a child with special needs that can’t be met, the suffering of the child, the guilt and grief of a family who can’t care for their child and then death, a relief from the suffering. With both deaths, that of an elderly couple who had lived a full life and that of a 5 month-old who had only just begun, I am caught up in the reality that “it is appointed unto man once to die, and then the judgement”. We never know when that moment will be…are we ready? Are we reconcilled with our loved ones? Can we say “no regrets”? I pray that we are. Life is too short. May God bless you! Oh my goodness. What a beautiful, powerful post. Thank you for sharing the photo of Wakins…..I am incredibly moved. It is so painful to know what a lot of babies and children go through when it seems people are wasting money on meaningless things. God bless the memory of Wakins.